Slow cooker Pozole Verde, sometimes spelled Posole, is easy cold weather comfort food with lots of Southwestern flavor. Chicken, hominy, and plenty of spices and herbs make it delicious while everyone’s favorite appliance, the slow cooker, makes it easy. 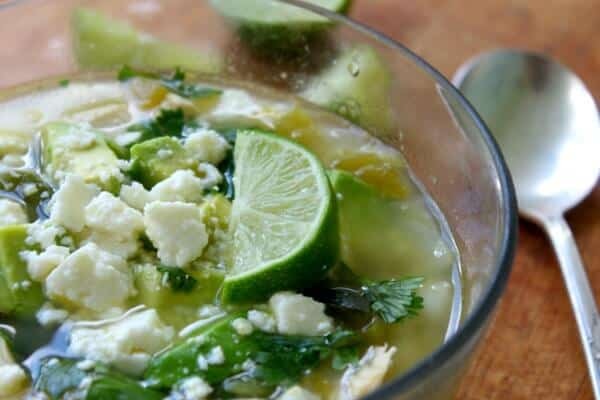 For this recipe you will need the following ingredients: olive oil, onion, poblano, jalapeno, garlic, diced green chiles, chicken stock, white hominy, chicken breast, cumin, and salt. 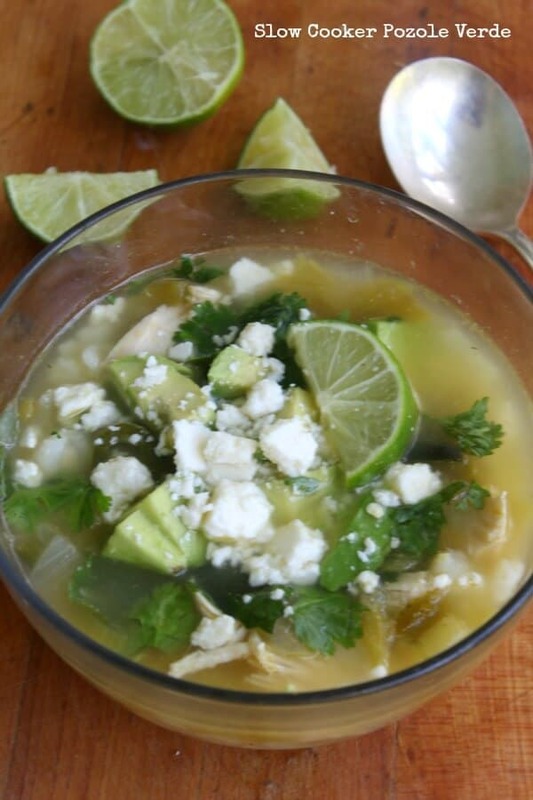 If you’re in a hurry click to go straight to the slow cooker posole verde recipe. If you know me you know that I have a strong affection for Tex-Mex and other Southwestern flavors. You also know that I am not likely to have a lot of time to prepare those recipes so I have learned to use shortcuts. Nothing makes a soup or stew better than a slow cooker and there is nothing that makes your kitchen smell better than a big batch of this pozole verde. Chicken simmers all day in chicken stock seasoned with peppers, cumin, onion, and garlic. When you serve it up the meat literally falls apart in the ladle. The hominy is chewy and is the perfect contrast to the tender meat. The steam from the hot broth carries up the aroma of all of those seasonings and if you close your eyes you can easily imagine you’re in Mexico. I went to Mexico with my parents when I was little but I don’t remember it. The next time I went was with my husband. We were on a cruise that stopped in to Cozumel on the way down the gulf to Belize, Honduras, and Roatan. While we were shopping in Cozumel we stopped at a little cafe to have lunch. After we had ordered the server brought us a batch of tortilla chips and queso. I was surprised by the queso because I was expecting salsa but I dug in with a chip and stacked up a layer of the orange queso on my chip. I happen to love queso so I wasn’t missing the salsa a bit. I took a bite of that chip and I thought the top of my head was going to explode. It wasn’t queso at all but a thick sauce made from habaneros. Lesson learned. When in a foreign country don’t assume anything. This slow cooker pozole verde is nothing you need to worry about. It’s just mildly spicy, perfect for warming up on a bitter cold day. It’s very brothy and I especially love it when I have a cold because it just seems to make me feel better every time. No matter how stopped up you are the flavors come through! I like to serve this with warm tortillas, butter, and a crispy green salad with an orange vinaigrette. The following is an affiliate link. If you click through and buy something I get a small commission which is used to maintain the blog. Thanks so much for being a part of Restless Chipotle! If you are in the market for a new slow cooker consider this one. Although I LOVE my slow cooker I am totallyl besotted with this one by CrockPot because it hooks up to wifi and you can tell it what to do with your smart phone! Crock-Pot Smart Wifi-Enabled WeMo 6-Quart Slow Cooker, SCCPWM600-V1 Here’s the slow cooker pozole verde. Give it a try and let me know what you think. Pozole is a light, brothy Mexican soup that is often used in conjunction with a celebration. It’s so good you won’t want to wait for a party to make it. Serve Pozole Verde with a crisp green salad. Add all of the ingredients except the garnish to your slow cooker. Shred the chicken with 2 forks before serving. 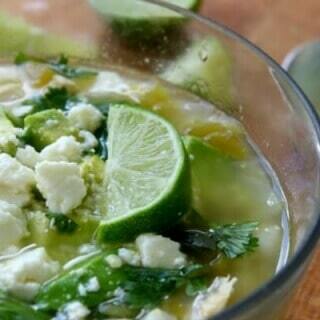 Garnish with toppings of choice, squeezing a little lime juice into each bowl. I had pozole when I was in Mexico a few months back, must recreate it asap! It’s so yummy! Definitely comfort food for me! This looks like a delicious dinner! Can’t wait to try this! I’m allergic to corn. What would be a good substitute for hominy? No need for low carb. You can add beans in place of it… 🙂 Garbanzo would be the most like the hominy. Wow. The smells of it cooking are heavenly. Taking a small bite before serving it to the family; just to correct the seasoning if I need to. I I think it tastes marvelous! I’m going to serve it over a bed of spinach in a deep bowl so that it wilts the spinach and becomes a really wonderful well rounded soup. Sounds great, Beth. Loved the Facebook pics! Would cauliflower come close totasting like the hominy? If not, what LC food item will? That’s what I am thinking. this looks like a perfect dish for new year’s day! I always make my white chicken chili on new year’s, so maybe it’s a mexican food thing! I’ll have to try yours! I love white chicken chili! This is lighter with a lot of the same flavors. I have never heard of this soup, but sure I would love it! I am really obsessed with my slow cooker and looking for recipe. Mmm! I love pozole and I haven’t made it in such a while! You verde version looks really great — especially made in the slow cooker! OK I adore my slow cooker and you are first person to give me the slightest twinge of buyer’s remorse. IT HOOKS UP TO YOUR WIFI????? Wowza! I love pozole and this one looks fantastic! I especially love that it is a green one. Thanks Laura. It’s so good on a cold day.. and I am so wanting that slow cooker! Hominy is such a fun and delicious ingredient – this soup sounds delicious! I love pozole and can’t wait to fill my slow cooker with this recipe! Slow cookers make everything so easy! This sounds like the perfect way to warm up on a cold day and I love how it’s made in the slow cooker!